In the Islay Whisky News I've Been Waiting For I mentioned the upcoming Laphroaig Live event at the Maker's Mark distillery in Kentucky. Today a dedicated website for the event has gone live at Distillery Live 2009 - Laphroaig live from Maker's Mark Distillery. Not too much to see just yet, but a nice countdown telling us how long we'll still have to wait. 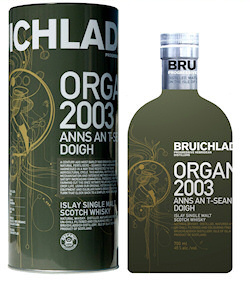 Bruichladdich in the meantime have released their first Organic Laddie, or correctly named ‘Bruichladdich 2003 “Culblair Farm” edition’. Funnily enough some of the blurb on the tin reminds me of the Coco Chanel Spoof Mark also picked up, with the mention of seaweed being used as fertiliser. According to the press release this is the ‘ultimate “single”, single malt (single farm, harvest, variety and vintage)’, of which 15,000 bottles have been released at an RRP of £39. Not too bad considering how some other upcoming whiskies are potentially to be priced. Slightly related The Telegraph (and various others) reports Indiana Jones fights for Bruichladdich. I think he had other roles as well though. I've mentioned the Ardbeg Corryvreckan yesterday, Kevin Erskine at The Scotch Blog now mentions Ardbeg Corryvreckan Launches Today. On Whisky Party it receives some focus in Best in Blog #32: Corryvreckan Makes Waves. Well, let's see once it's really out. Last but not least I've read in The Ileach something which leads me to believe that the daughter of an Islay distillery manager recently graduated from university. I think I'll raise a wee dram of Bunnahabhain to that. Congratulations!